Large - 11"- 12" X Large - 12"- 13" Small - 9"- 10" Medium - 10"- 11"
Neoprene Elbow Sleeve provides even compression and support to the elbow. 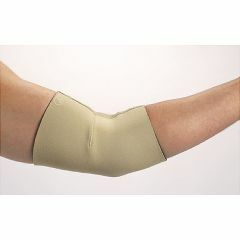 Retains body heat to help accelerate healing and helps to protect against scrapes and bruises. 210003L - Large - 11"- 12"
210004XL - X Large - 12"- 13"
210001S - Small - 9"- 10"
210002M - Medium - 10"- 11"